Sysco AV oversees the design, project management and delivery of audio, visual and control systems packages for museums and exhibitions, conference and arts venues. Задача: Chatham Dockyard wanted to use audio and projection technology to recreate the sights and sounds of a 16th Century dockyard. Projection, audio and lighting, and the opening and closing of doors needed to be perfectly synchronised so that each element was triggered at the precise time in the visitor journey. Решение: Sysco Audio Visual installed 17 Optoma projectors into the experience - the 6,000-lumen EW865 projector, 4,500-lumen EW775 and 4,000-lumen EH2060. Результаты: The EW865’s motorised lens shift, focus, zoom and extensive lens options, provided installation flexibility and its ability to be installed 360° on its horizontal axis allowed the team to project onto the floor and ceiling as well as front and rear projection. The three projectors are bright and produced the high resolution image quality that was needed. They also integrated perfectly with the control system. The Trust wanted to re-interpret its much-loved Wooden Walls of England Gallery with new technology and interpretation techniques. This exhibition, now over 20 years old, showed how wooden warships were made when dockyards were the industrial centres of Europe. Located on the River Medway just outside London, Chatham Dockyard has played a vital role in supporting the Royal Navy for over 400 years. From the Spanish Armada in the 16th Century to the Falklands Crisis, ships have been built and repaired at Chatham. These include Lord Admiral Nelson’s famous ships - the Victory and the Valient. In March 1984 four centuries of shipbuilding and repair came to an end as the Navy ended its 400-year association with the dockyard. 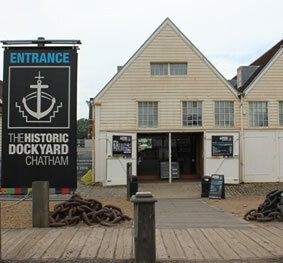 The Georgian yard, with its 100 listed buildings (of which 47 are Scheduled Ancient Monuments) was set aside for preservation as The Historic Dockyard, in the stewardship of the registered charity – the Chatham Historic Dockyard Trust. Now a thriving visitor attraction, Chatham Dockyard is the world's most complete example of an historic dockyard from the age of sail. It is regularly used as the film set for period dramas, such as Mr Selfridge and Call the Midwife. Due to its existing popularity, it was important to retain elements of the original exhibition but bring the story of people, ships and processes to life in a vivid, engaging and exciting way. The planned Hearts of Oak exhibition would follow the journey of the retired Master Shipwright, John North, as he relives his role as the Valiant’s carpenter and encourages his grandson to follow in his footsteps rather than joining Lord Admiral Nelson’s fleet in the Royal Navy. 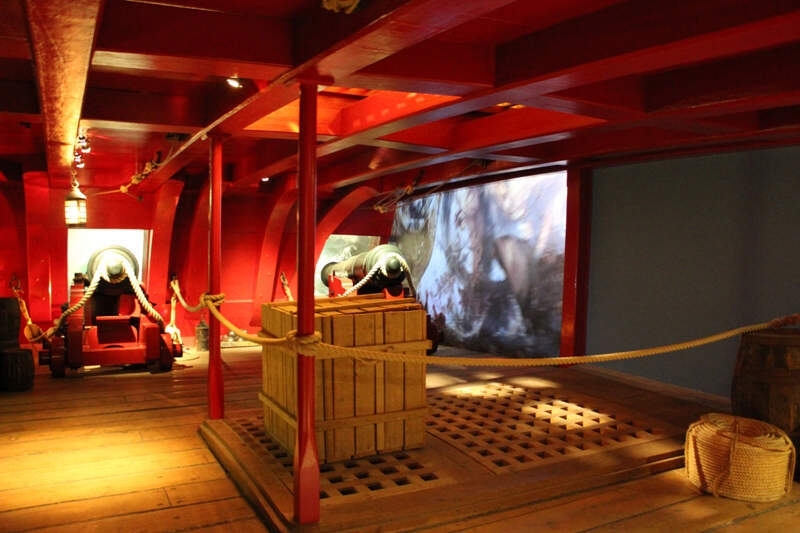 The exhibition needed to use audio and projection technology to recreate the sights and sounds of the dockyard. It needed control and lighting solutions that would lead visitors through each stage of the story by synchronizing projection, audio and lighting, and the opening and closing of doors. This needed to perfectly choreographed so that each element was triggered at the precise time in the visitor journey. The team also needed to ensure visitors could not hear what is coming in the next room. Sysco Audio Visual was commissioned to advise on the AV technology for the experience and joined the creative team which consisted Chatham Historic Dockyard Trust, designers - Land Designs Studios, media content creators – ISO Design, lighting designers – Studio ZHA and Peter Key Sound Design & Production. Sysco recommended and installed 17 Optoma projectors into the experience. The bright EW865 6,000-lumen projector with WXGA resolution has motorised lens shift, focus and zoom, which combined with the extensive lens options, provided real flexibility in installation. Its ability to be installed 360° on its horizontal axis allowed the team to project onto the floor and ceiling as well as front and rear projection. It also installed the 4,500-lumen EW775 and 4,000-lumen EH2060. Hosts in 16th Century costume greet visitors at the start of the attraction to set the scene for the story. Following John North and his grandson, the journey starts in the timber yard where hundreds of thousands of oak, elm and fir trees were used to make the ships. Visitors watch the wood being bent to shape, visit the mould room and iron works, and see the panels hammered on to the hull. The master shipbuilder explains how they cocked the hull to make it watertight before the final stage of arming the gundeck, where the grim reality of fighting on these ships is brought to life. ISO Design created the videos that were projected within the attraction to tell the story. It developed the script and appointed the actors that would play the characters. 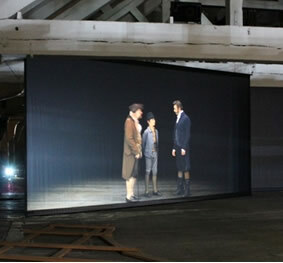 It was filmed in broadcast quality so that the six metre-wide projected image still looked crystal clear. 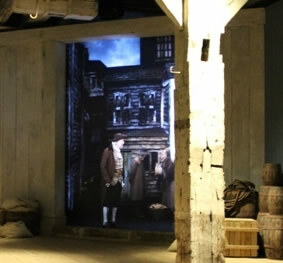 They also used 3D projection mapping to make visitors feel that they are actually standing in the midst of the timber yard. Sysco installed 7th Sense Delta Nano media servers to playback the main show media. The Delta Nano servers provided the complete video playback solution for the projection, and maintained the synchronisation and triggering of media with frame accurate dependency. This also provided the attraction with frame-accurate lighting cue triggering and enabled multiple subtitle options to be switched via the control system depending on the language preferences of the visiting group. Audio was used extensively in the old exhibition and continues to play a vital role in the new experience. Around 50 studio quality active speakers are used throughout the exhibition with high and low sound levels to set the scene, create atmosphere and tell the story. The audio is in English with optional subtitles in French, German or Spanish throughout the exhibition. The subtitle language is set by the hosts at the start of the tour from a simple user interface displayed on the Crestron Touch panel. The system has the ability to add additional languages into the subtitle system at a later date. To ensure sound isolation and avoid visitors hearing what is in the next stage of the exhibition, the timing of audio was perfectly choreographed in the adjacent room to muffle any sound. Crestron was installed as the overriding control system. This is programmed to start the experience every ten minutes. It is scheduled to power up and trigger the first show in the morning, opening and closing doors and starting the projection and lighting at exactly the right time. The host can use the Crestron controller touch panel to trigger the show manually if there are fewer visitors on a certain day. They can also override the system in an emergency to open all the doors. Sysco has remote access to the exhibition, enabling its engineers to carry out preventative maintenance, turn the exhibition on or off and look at log files to identify any problems. Before handover, they trained the team at the Historic Dockyard to operate the system and identify any warning signs.